PALO ALTO, Calif.,-- August 7 is Black Women's Equal Pay Day, which marks how far Black women had to work into 2018 to catch up with what white men earned in 2017 alone. On average, Black women are paid 38 percent less than white men and 21 percent less than white women. To raise awareness of the pay gap and its negative effect on Black women and families, LeanIn.Org is launching #38PercentCounts, the second of three public awareness efforts this year rooted in the idea that equal pay matters. New research conducted by LeanIn.Org and SurveyMonkey in partnership with the National Urban League shows that there remains a striking lack of awareness around the pay gap Black women face. One in three Americans is not aware of the pay gap between Black women and white men, and half of Americans are not aware of the gap between Black women and white women. For Black women, being paid less is just the tip of the iceberg. Compared to white women, Asian women and Latinas, Black women receive less support from managers and are promoted more slowly. These unique challenges faced by Black women—and women of color more broadly—are examined in LeanIn.Org & McKinsey & Company's annual Women in the Workplace study. "Black women deal with double discrimination every day—they face biases for being women and biases for being people of color. One place where we see that double effect is in the 38 percent pay gap," said Rachel Thomas, president of LeanIn.Org. "That translates to more than $800,000 lost over the course of a career with staggering real-world implications. We're grateful to our partners and the Lean In community for working to raise awareness of the pay gap Black women face." LeanIn.Org, SurveyMonkey, and the National Urban League's recent survey findings also show that even when people know there's a pay gap, it's bigger than they realize. Forty percent of people who are aware of the pay gap Black women face underestimate its size. Moreover, the data show significant differences in how Black women see the workplace compared to everyone else. About half of white men think obstacles to advancement for Black women are gone but only 14 percent of Black women agree. Moreover, nearly 70 percent of people who are not Black think that racism, sexism or both are uncommon in their company—yet 64 percent of Black women say they've experienced discrimination at work. 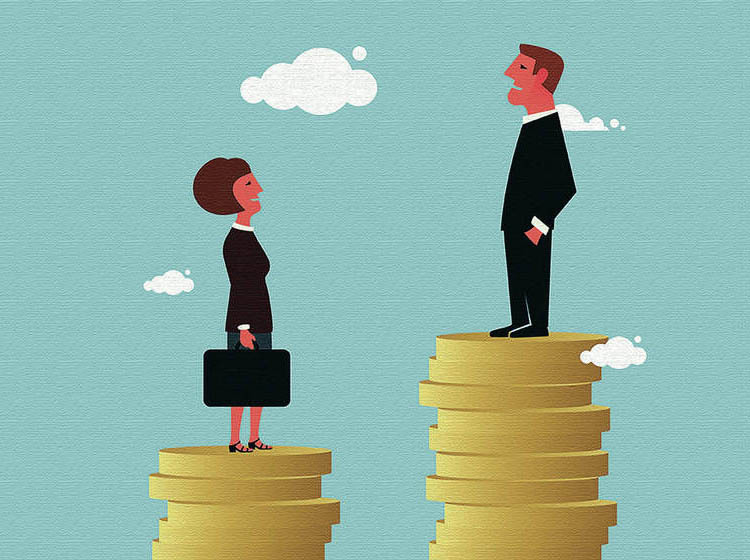 "The lack of awareness about the pay gap at their own workplace, particularly among hiring managers –two-thirds of whom say there is none– is an insight we hope drives organizations to take action," said Sarah Cho, Director of Research at SurveyMonkey. "Conducting a pay equity study is a powerful way to bring this topic into clear terms, but we also hope these data spark curiosity within companies to measure perceptions about inclusion, so they can build broader programs and policies to help drive meaningful change that lasts." "Our plan is that bringing awareness to this injustice will lead to concrete action," said Marc H. Morial, President and CEO of the National Urban League. "Not only would fair pay for Black women drastically narrow the racial economic gap, but it would go a long way toward stabilizing our national economy. Because Black women disproportionately are heads of households, fair pay would create a ripple effect that could lift entire communities." To further bring the impact of the pay gap to life, LeanIn.Org collaborated with Annabelle Hayford, the creator of the viral hashtag #DrawingWhileBlack, to illustrate a series of cartoons that highlight the unfairness of the pay gap for Black women. Additionally, LeanIn.Org is releasing a video of Black women and their families—many from our Lean In Circles community—explaining what earning less means for them. When asked what 38 percent more would mean in their lives, one woman says she could retire comfortably, another says it would go toward her son's education, and a family explains they could use the lost income to buy a house—or "two houses, actually," says their son. At leanin.org/38percentcounts visitors will be able to show their support for #38PercentCounts, watch our campaign videos, and see the Black women's pay gap "by the numbers." In addition, business leaders and managers will learn what they can do to close the pay gap in their companies, and women will learn expert tips and tricks for negotiating more effectively. Too many people don't know that Black women are paid less. More than 30 percent of Americans are not aware that, on average, Black women are paid less than white men. Even when people know there's a pay gap, it's bigger than they realize. On average, Black women are paid 38% less than white men, which amounts to almost $870,000 lost over the course of a typical career. 40% of people who are aware of this gap underestimate its size. People are overly optimistic about the state of Black women. About half of white men think obstacles to advancement for Black women are gone, but only 14% of Black women agree. Moreover, nearly 70% of people who are not Black think that racism, sexism or both are uncommon in their company—yet 64% of Black women say they've experienced discrimination at work. When people know there's a pay gap, they think it's unfair. When presented with information that Black women on average are paid 38% less than white men, 72% of Americans think it's not fair. "Black women earn 38% less than white men in the United States. It's time to level the field," said Karen Parkin, Chief HR Officer and adidas Executive Board Member. "Through our partnership with LeanIn.Org, adidas and Reebok are raising awareness of the pay gap. Because women and their families deserve an equal shot. Because fairness matters and #38PercentCounts." "At Lyft, we celebrate inclusivity, diversity and equity, and we believe in taking a stand for issues that matter," said Nilka Thomas, VP of Talent and Inclusion at Lyft. "We are honored to support LeanIn.Org's efforts to raise awareness of the pay gap Black women face, and the negative effect it has on them and their families. We are committed to doing our part to ensure there are no unexplained pay gaps through annual audits, which year-over-year have shown no discrepancy based on gender or race. To support Lean In's efforts to raise awareness, we'll be asking passengers to imagine their ride ending 38% early." "We're proud to support Lean In's efforts to raise awareness about the pay gap faced by black women in the US, and to highlight the unfairness of this gap," said Carolyn Tastad, Group President, North America & Executive Sponsor for P&G's Gender Equality efforts. "At P&G, fair pay practices and an equitable workplace are core company beliefs and essential to our long-term success."